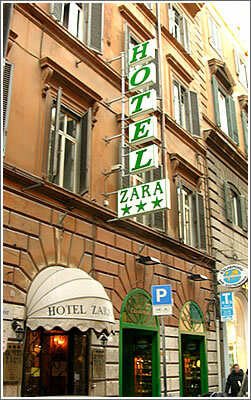 The Hotel Zara Rome is a modern and friendly family owned hotel in the center of Rome. The three star hotel is perfectly located for tourists, business travellers and families alike. The Hotel Zara Rome has 42 rooms all of which feature air conditioning, private bathroom (with tub or shower), satellite tv, mini-bar and central heating. All of the décor within the hotel exemplifies the Roman traditions of style and sophistication - and the actual building itself is a traditional Italian Palazzo dating back to the beginning of the last century. The Hotel Zara Rome is located in the historical centre of Rome where the remains of an illustrious past provide the backdrop to a modern bustling metropolis. The famous Spanish Steps and the prestigious shopping street of Via dei Condotti are only a few minutes walk from the hotel. Rome's main train station "Termini" is also within walking distance - as are attractions including the Trevi Fountain, Colosseum and Piazza Santa Maria Maggiore. The Hotel Zara Rome offers a comprehensive range of hotel services to make sure that our guests stay in Rome is a pleasant and enjoyable one. Services include Breakfast Room, 24 hour bar, TV lounge, lift and more. The Hotel Zara Rome concierge provide a friendly and professional approach to our guests and remain at your complete disposal for the duration of your stay. Reserve a room at the Hotel Zara Rome by using our secure online booking facility.